Welcome to Day 2 of our blog hop with Bo Bunny design team! So excited to share wonderful inspiration created with both companies’ products. Check out what each talented design teams have done. If you missed Day 1, click: 2016 Blog Hop with Bo Bunny – Day 1! Don’t miss the opportunity to win a giveaway…stay tuned for details at the end of the post. Today is National Hot Cocoa Day! Just for the occasion, I made a “Let It Snow” pocket card with hot cocoa mix, using 3D Foam products and Bo Bunny’s Winter Wishes Collection. My “go to” for paper construction such as this pocket, I use E-Z Runner® Ultra Refillable Dispenser. It is perfect for its strong hold. To accent the inside the beautiful winter scene is the Creative Photo Corners Silver. Just add hot cocoa and it’s ready to go! 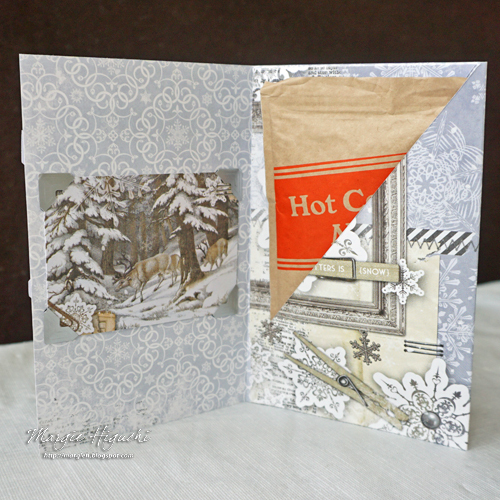 For more details and step-by-step tutorial, visit my blog by clicking: Let It Snow Hot Cocoa Pocket Card Tutorial. Hello, Amy here! I’m so excited to be part of this blog hop with Bo Bunny. My project features paper from the Felicity collection, Cherished and Dreamer. The Coffee to go cup has sleeve and poinsettia that is designed with paper from the Natural Necessities paper pad. All the panels of paper have been adhered using the E-Z Runner® Grand Dispenser. The poinsettia bloom has been put together with Thin 3D Foam Squares Mix White. This gives the shaped card more visual interest. The leaves are from the Felicity Noteworthy package. They are perfect for my card design and holiday card for any coffee loving friend! If you cannot see the comment section (at the bottom of this post), please click: 2016 Blog Hop with Bo Bunny – Day 2 and scroll down to the bottom of the post. This entry was posted in 3D Foam Squares, Adhesives, Announcement, Cards, Crafts & Tutorials, Creative Photo Corners, E-Z Runner® Dispensers, Seasonal Craft Ideas, Winter and tagged 3D Foam Squares Mix Black, 3D Foam Squares Mix White, 3D Foam Squares Regular White, 3D Foam Squares Small Black, Amy Tsuruta, Blog Hop, Bo Bunny, Card, Creative Photo Corners Mix Pack, Creative Photo Corners Silver, E-Z Runner Grand Dispenser, E-Z Runner Ultra Refillable, Margie Higuchi, Memory Box, Paper Smooches, Pretty Pink Posh, Reverse Confetti Stamps, Shaped Card, Spellbinders Paper Arts, Thin 3D Foam Squares White, Winter. Bookmark the permalink. 59 Responses to "2016 Blog Hop with Bo Bunny – Day 2"
Always love seeing cute coffee-themed projects! So cute! I would love to win. The project is very nice. I love the cocoa pocket card. Such a wonderful way to let someone know you’re thinking of them…with a special little treat! dispenser. I love all of your adhesives! I love the pocket card idea and I would love to try the E-Z Runner® Ultra Refillable Dispenser. Thanks for sharing. I need some adhesives badly…..thanks for the giveaway! 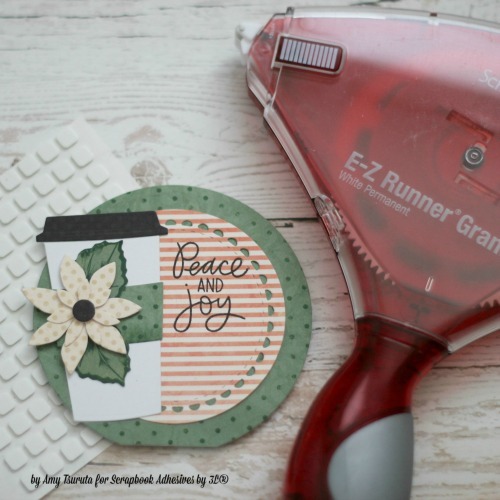 I would love to have the EZ runner Grand dispenser – I’m always running out of adhesive! Stunning projects today, love and use my scrapbook adhesives lil foam dots so much I now buy them in qty 5 pkgs at a time..
I’ve always wanted an EZ Runner tape dispenser…would LOVE to win one. Thanks for the awesome giveaways and inspiration…love the projects! Would love to try this. Have a lot of your other adhesives. What a pretty coco holder! Both cards are lovely. Margie’s is so wintery lovely. And I love the circle card, Amy! So precious. Love your cards!!! My favorite adhesive is the E-Z Grand tape runner. Adorable card Amy. I have never tried the EZ runner would love to win it! Beautiful project and very inspiring to a novice like me. cute projects!! Thanks for a chance to win! Margie, I love your cocoa holder! It’s beautiful! What a fabulous hot chocolate gift card and wonderfully dressed to-go cup!! Super beautiful and creative projects! 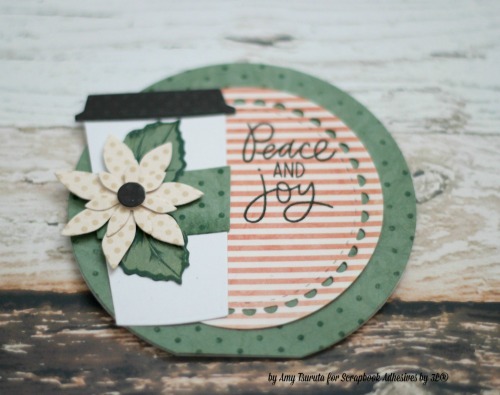 What’s not to love in a Cocoa Pocket Card and a beautiful circle card… with a cup :)? And… I would love to win the E-Z Runner Grand! So live this project. Be great to send to my Grandkids! Thanks for the inspiration. BTW, Santa, I could use a EZ Runner grand! * Wanting to try the E-Z Runner Grand~it looks awesome! Great projects! Love the hot cocoa pouch card! Cute coffee cup card too! I love your 3D Foam Squares and would love to win some of those! Love your ideas. The cocoa gift holder is so pretty. Great hop. Great prizes! Love the cards! Day two is so cool. Love the chance! The EZ Runner Grand looks fabulous, would love to try it! The pocket card is ingenious. Love to try the E-Z Stars runner. BEautiful! Love the EZ Runner! Love your cards! Love the EZ Runner! Beautiful card. Love the ex runner too. That would be the ez runner. Love the Coffee Cup medallion is delightful. The Let It Snow card is so beautiful it should be framed. Great job, Ladies. I love Margie’s super beautiful and super sweet cocoa gift card! Perfection, it is!!! And Amy’s circle coffee card is so pretty and fabulous in every!!! Thanks for both these wonderfully inspiring and creative cards today, ladies!!! 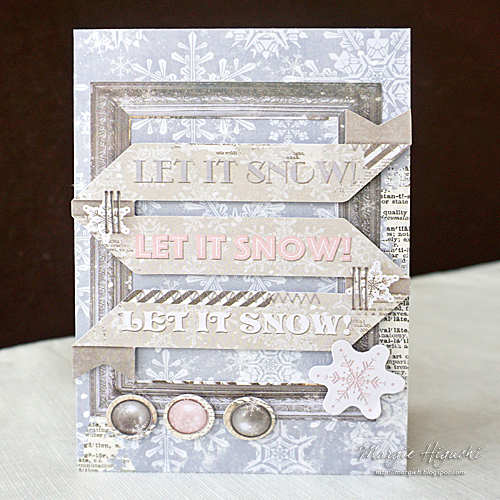 “Let It Snow” pocket card fantastic Job!!! Margie’s. Day 2 can not get better. Love Margie’s “Let it Snow” hot chocolate gift holder! Fabulous! And Amy’s adorale coffee card is perfect for another gift (card) holder too!! Gets better each day!